Edward Christopher Sheeran, commonly known as Ed Sheeran, is a famous English musician, record producer, as well as a singer and songwriter. Ed Sheeran rose to prominence in 2011 with the release of his debut album, simply entitled “+”. Released to generally positive critical reviews, the album produced such popular singles as “The A Team”, “Small Bump” and “You Need Me, I Don’t Need You”. Upon its release, “+” sold more than 102,000 copies in the United Kingdom, and made it to #5 on the Billboard 200 music chart in the United States, with over 42,000 copies sold. Consequently, the album brought him two Brit Awards, as well as the Ivor Novello Award for “The A Team” song. Following his successful debut, in 2014 Sheeran released his second studio work under the name of “X”. Just as its predecessor, the album has enjoyed positive critical feedback and commercial success. With such singles as “Don’t”, “Thinking Out Loud” and “Sing”, “X” became the most-streamed album on “Spotify” music streaming service, with more than 430 million streams in 2014 alone. The album was also featured in a list of “Top 10 Best Albums of 2014” and “Top Albums of 2014”. A well-known singer, how rich is Ed Sheeran? According to sources, in 2011 his debut album “+” brought him $1 million in record sales. In regards to his overall wealth, Ed Sheeran’s net worth is estimated to be $16 million, most of which he has accumulated due to his involvement in the music industry. Ed Sheeran was born in 1991, in Yorkshire, England, although his family soon relocated to Suffolk. Sheeran studied at Thomas Mills High School, and later joined the National Youth Theatre. As a child, Sheeran expressed a desire for singing and playing guitar, which he learned to play when he was four years old. Inspired by the likes of Bob Dylan and “The Beatles”, Sheeran decided to pursue a career in music. Consequently, in 2005, he came out with his first extended play entitled “The Orange Room EP”. He then decided to move to London, where opportunities for being noticed were better. Around the same time, he started to perform at various venues, and even took part in the audition for the “Britannia High” television series. His second extended play came out in 2009, under the name of “You Need Me”. That same year, Sheeran managed to play a total of 312 gigs in the United Kingdom. A year later, Sheeran released his “Loose Change EP”, which produced an award-winning single “The A Team”. In 2010, he decided to relocate to the United States, and settled down in Los Angeles, where he started performing at various clubs. He was then discovered by the famous actor and singer Jamie Foxx, who contributed to his initial fame and success. 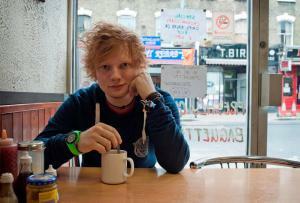 Soon afterwards, Ed Sheeran released “No. 5 Collaborations Project” extended play, as well as his debut album entitled “+”. In regards to his personal life, Ed Sheeran is currently dating a singer and former member of “Consort with Romeo” band Athina Andrelos.